While the origins of the Bloody Mary are not 100% clear, the Bloody Mary as we know it was ‘created’ by Fernand Petiot at Harry New York Bar Paris in 1921. Sure, folks were already making a drink of 50/50 Vodka and Tomato Juice, but Petoit, added a the spice factor. 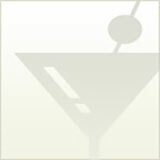 When Vodka started to gain popularity in the 1950s the Bloody Mary really took off. 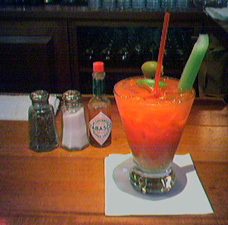 The Bloody Mary has become a Sunday morning tradition, sometimes replacing the morning meal entirely. Tomato Juice and a piece of celery make a very nice breakfast than you very much. It has also taken it’s place as a hang over helper, Hair of the Dog, ya know. Well not really, the only real hangover cure is hydration and rest. There are more Bloody Mary recipes than one can count. Who doesn’t have their special mix? Let us know if the comment how you put your personal twist on the classic Bloody Mary. Combine in a collins or bucket glass filled with ice. Stir well. Garnish with a lime squeeze, and celery stick, olive, marinated string bean, or kosher pickle. This Bloody Mary from O’Davey’s Irish Pub &amp; Restaurant in Fond du Lac, Wisconsin is a complete meal. 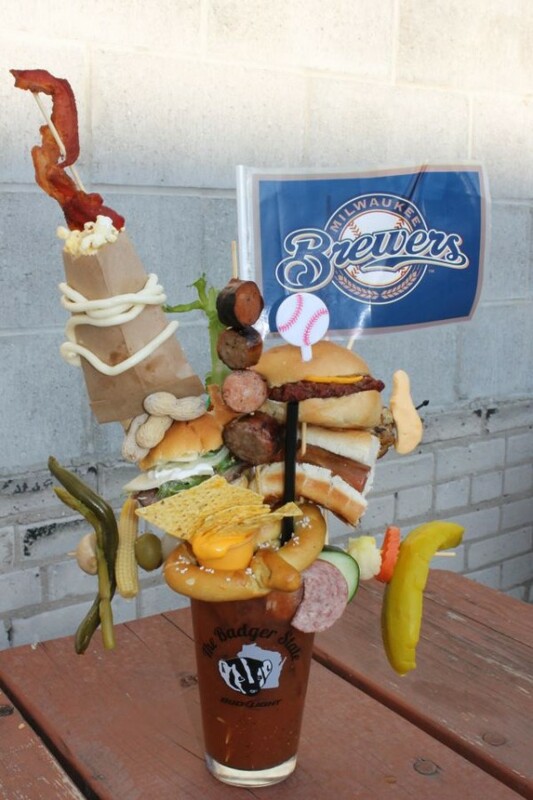 The Extreme Bloody Mary, “is topped with an extensive beer chaser consisting of pop corn, bacon, peanuts, beans, sausage, pretzel, sliders, a pickle and (this is Wisconsin after all) a cracker and cheese curd. Plus a Brewers flag”.